This is a beer I have heard a lot about. I had never seen it in the part of the US where I grew up, mostly only sold out west. I was pretty astonished to find it in the supermarket right up the street from my house. I have never had this style of beer before. 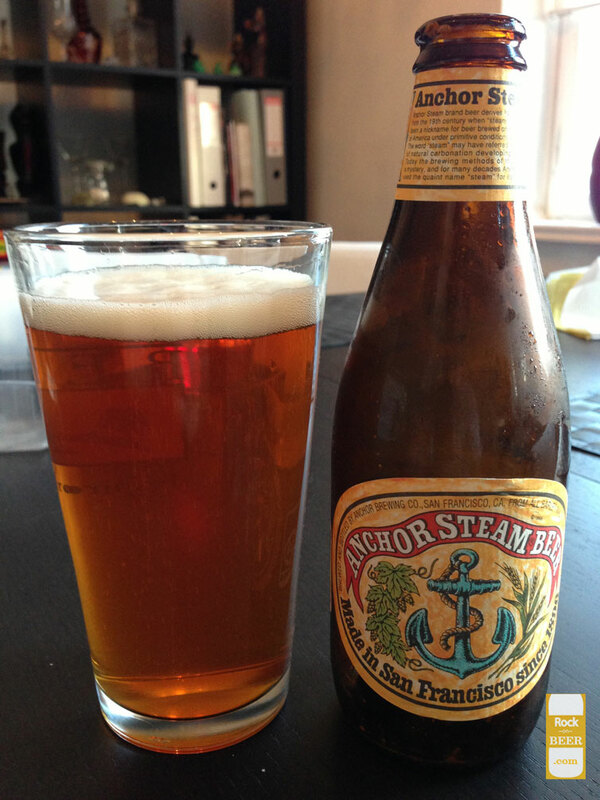 The steam in the name anchor steam beer comes from the unique style born from the no available refrigeration in California so they had to breed a high temperature lager yeast. Ok enough history on to the taste. It pours a dark amber with a big lingering head and plenty of lacing. A caramel malt up front taste with a pleasant sweetness and a fruity tone to the taste. I have heard the fruity taste comes from the unique yeast they use. It is a really interesting beer. I don't normally like lagers much, but this one is changing my opinion. A full rich flavor that just tastes like a real beer. It's too bad this beer is not more widely available, but I doubt i will find many examples of a California original style beer here in Europe.